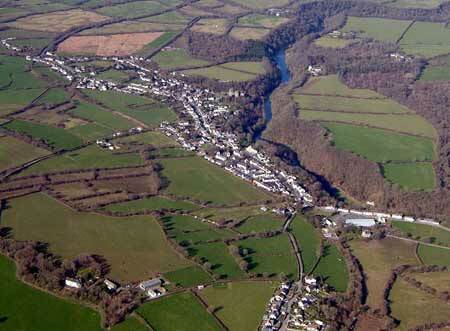 This is the built-up area of the small, handsome town of Cilgerran, pembrokeshire. It lies within the medieval Cantref Emlyn, in Emlyn Is-Cych commote. Cantref Emlyn had been partly brought under Anglo-Norman control in c.1100 when Emlyn Is-Cych commote was reconstituted as the Lordship of Cilgerran. Cilgerran remained a marcher lordship, administered from Cilgerran Castle, which was established in c.1100. The lordship was regained by the Welsh in 1164 and remained under their rule until 1223, when William Marshall, Earl of Pembroke, took it. It was held of the Earldom of Pembroke until it passed to the crown in the late 15th century. It was eventually abolished in 1536, when the lordship was incorporated into Pembrokeshire as the Hundred of Cilgerran. 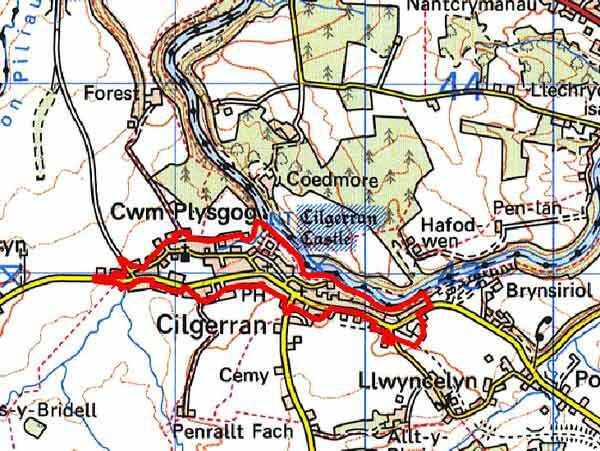 The castle may not occupy the site of the pre-Norman commotal centre, as it does not appear to have acquired the name of the lordship, Cilgerran, until the mid 12th century, being referred to as ‘Cenarth Bychan’ when it was the scene of a daring Welsh raid in 1109. William Marshall started rebuilding the castle in stone in 1223, and it was largely complete by the late 13th century. Its two massive ‘drum’ towers still dominate the landscape. A settlement developed outside the gates of Cilgerran Castle, large enough to be termed a ‘town’ in 1204. It was regarded as a borough, but by prescription only, as no charter is known. Its regular plan, comprising burgage plots laid out either side of a long main street, with a broad market place, and a second street at right-angles, suggest that it was planned. Twenty-two taxpayers were recorded in 1292 - rather less than the 70 or so burgage plots still discernible - and it appears that the town was still growing. In c.1610 Speed listed it among the principal market towns of Pembrokeshire. The predominantly Welsh demographics of the lordship are reflected in the Welsh names of the taxpayers. The town had its own gaol, and stocks. It appears always to have kept its links with the land, and the chief occupations of the townspeolpe during the post-medieval period were farming, salmon-fishing and slate-quarrying. Cilgerran and the quarrying industry had long been closely linked, burgesses having had the right to dig for stone within the Teifi Gorge, where all the major quarries were located. Some of the stone-processing buildings, including a dressing-shed, were located in the town. The wealth of the industry at its peak, in the late 19th century, is reflected in the town’s buildings, many of which were clearly built or rebuilt at this time using local stone. Some further growth of the town occurred, doubtless encouraged by the Whitland - Cardigan railway line, which was incorporated in 1869 (but closed in the 1960s). A chapel was established, and a brickworks, although brick is not a common building material in the town. However, the weekly market recorded by George Owen ended in the early 1900s; the fair had been discontinued many years previously, while quarrying ceased in 1938. The abolition of the lordship in 1536 had already seen the abandonment and decline of Cilgerran Castle. It saw no action during the Civil War and was allowed to become a ruin, albeit the source of inspiration to Romantic painters. The ditch became the town pound, and as a result of quarrying carried out around the castle, a large stretch of the castle wall itself fell in 1863. However, it has been in the care of the state since 1943 and is now one of the chief visitor attractions of the region. This is a relatively small, built-up historic landscape character area consisting of the small town of Cilgerran, lying on relatively flat land at about 35m above sea level immediately to the south and above the Teifi valley gorge. It is essentially a linear settlement, with houses tightly packed along a main street, and the old triangular-shaped market place of Castle Square (encroached upon by 19th century buildings) with the large, ruined, 13th-14th century stone castle to the north, and the church of St Llawddog detached some distance to the west. The church, except for the medieval tower, was twice entirely rebuilt during the 19th century. Burgage plots (house plots) flank the market place and main street. These together with the settlement morphology indicate a small medieval planned town. Medieval planning has dictated the modern form of the settlement, with houses of a standard burgage plot width squeezed tightly against their neighbours, lying hard against the street frontage. This has resulted in terraces of individual buildings – there are few examples of single-build terraces – as there is little space for detached buildings in the narrow plots in the centre of the settlement. There are some detached- and semi-detached houses, particularly on the edge of the settlement. Apart form the medieval church tower and the castle ruins, virtually all the older buildings in Cilgerran date to the 19th century, with most belong to the second half of the century. Teifi valley slate (Cilgerran slate) is used exclusively on the oldest buildings, with red brick appearing towards the end of the 19th century. The majority of the buildings are cement rendered (stucco). North Wales slate is used on roofs. Along the main street, and on Castle Square, houses are mainly two-storey mid to late 19th century with their symmetrical front elevations and large window openings placing them firmly in the ‘polite’ Georgian tradition. However, some vernacular and probably early traits such as smaller windows, asymmetrical frontages and large, squat chimneys survive on some houses. Teifi valley slate masonry, where not covered by cement render, is of very high quality, with squared- and sawn stone laid in courses. Decoration is confined to chisel pecks on the sawn surfaces. Several examples of these buildings are listed, as is the mid 19th century architect-designed ‘Georgian’ Rectory. Cement render is used probably on buildings with poorer quality masonry, or over brick on later buildings. 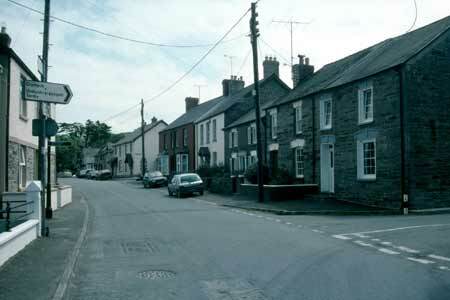 Terraces and individual houses with many more vernacular traits lie to the west of the main settlement core at Cwm Plysgog and to the east at Cnwcau. A former stone-built stone-dressing shed is located at this latter location, although most of the quarries have been assigned to another historic landscape character area. Other buildings in Cilgerran include at 19th century chapel, a 20th century school, a coracle fishing/visitor centre, and limited modern housing on the outskirts of the settlement. There are few recorded archaeological sites here other than those related to the standing buildings. Cilgerran is a very distinct historic landscape character area. Its built up nature contrasts with its neighbouring rural areas.